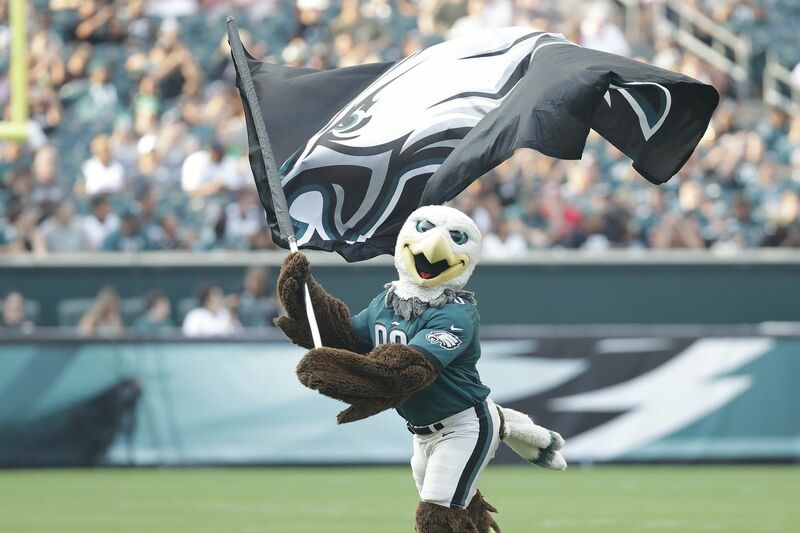 Eagles mascot Swoop runs on the field before the start of open public practice at Lincoln Financial Field in South Philadelphia on Sunday, Aug. 5, 2018. Eagles season is finally back. The Super Bowl champs will return to Lincoln Financial Field Thursday at 8:20 p.m. to take on the Atlanta Falcons in the NFL's season opener. With the Eagles' first-ever Super Bowl win against the New England Patriots just seven months behind us, fans are ready for tonight's game. Here's everything you need to know about getting to the game and the best ways to join in on the fun, whether you're able to make it to the field or not. If you've already scored tickets, remember to keep your phone charged. The Linc has recently transitioned to a mobile ticketing platform, meaning tickets will need to be scanned through the team's official app in order to gain entry. Fans can transfer tickets or post them for resale on the app, too. Still haven't bought your tickets? Verified resale tickets are still up for grabs, but they'll cost you. Prices range from around $170 to upwards of $700 via Ticketmaster as of Thursday morning. The Eagles are advising fans to be in their seats by 7:30 p.m. to catch the unveiling of a special Super Bowl banner. Heading to Lincoln Financial Field? You can save a few bucks on transportation. SEPTA, Miller Lite and Muller Inc. are partnering to bring Eagles fans to the South Philadelphia stadium for free, sponsoring rides on the Broad Street Line between 4 p.m. and 1 a.m.
"Following their winning season, we want Eagles fans to continue to celebrate responsibly," Diane Wagner, alcohol responsibility manager for MillerCoors, said in a statement. "We're proud to partner with SEPTA and Muller Inc. for the sixth year in a row to offer football fans transportation on their first home game of the season." Planning on driving instead? Expect to pay $40 to park your car during Eagles games, according to the Linc's website. Those planning on a good ol' fashioned tailgate can plan to get to the Linc early. Parking areas — outlined on the Linc's website — are open about four-and-a-half hours before kickoff. Avoid the lots north of Pattison Avenue and west of Darien Street: There's no tailgating allowed there. There are plenty of organized tailgate parties too for those without a Bird gang to call their own. The Linc's Miller Lite Tailgate Zone is found at HeadHouse Plaza, while 94WIP has its own tailgate zone going on until the end of the season outside the Wells Fargo Center. Xfinity Live! will also be celebrating. Cav's Philly Tailgates' party begins at 4 p.m., complete with the classic hamburgers and hot dogs as well as filet mignon sandwiches and penne pasta, according to its Facebook event page. The ultimate pre-game celebration may just be happening at the waterfront. The NFL will turn the Great Plaza at Penn's Landing into an all-day festival that lasts from 10 a.m. until 8 p.m. The event is free and will have all 52 Super Bowl rings up on display, a chance to take a photo with the Vince Lombardi Trophy, appearances from players like Brian Dawkins and Brian Westbrook as well as a performance from singer/songwriter Shawn Mendes. "It was a great experience being in Philadelphia for the draft last year," said Peter O'Reilly, the senior vice president of NFL events. "And when the NFL comes to town for Kickoff, fans are very happy, because it means they won the Super Bowl." Fans heading to a tailgate should keep a few water bottles handy and bring a poncho for the game. The high temperature is expected to reach the mid-90s, with precipitation possible at game time. Umbrellas and bottles aren't allowed inside the Linc. The stadium's website has a full list of prohibited items you'll want to check out before packing up. The opener will be available to stream for free on the NFL Mobile, Yahoo Sports, Tumblr and AOL apps. Follow staff writers Zach Berman, Jeff McLane, Les Bowen and Paul Domowitch on Twitter for the latest news and commentary. The Inquirer and Daily News' live blog will launch at 8 p.m.